Minigames have never been so much fun. Come and play with the Party Pals and have the happiest party in the World! Play minigames to generate happiness, then relax on the beach and enjoy the sun, fun and party atmosphere. Guaranteed to make you smile. Join the Super Happy Party Pals and test your gaming skills across lots of different minigames. Can you unlock all of the stickers, games, accessories, items and achievements? Play together as a family and with friends in the multiplayer Party mode. Who will win the most points. Everyone will have fun playing together. There are also mini games where you have to play together to win. As well as competitive player versus player. In the single player mode you must help the Minis have the happiest beach party in the World. You can do this by earning happiness by successfully playing lots of mini-games that will test your gaming skills. Solve puzzles, remember tunes, repeat patterns, react quickly and be quick to find hidden characters. Everyone has their own favourite mini game. With three difficulty levels to unlock, everyone in the family can play along. Who will get the furthest? You can then spend that happiness on unlocking items, objects and more mini-games. All of these will earn you even more happiness. Unlock and upgrade items for the beach, use your happiness to receive gifts of accessories for the characters. 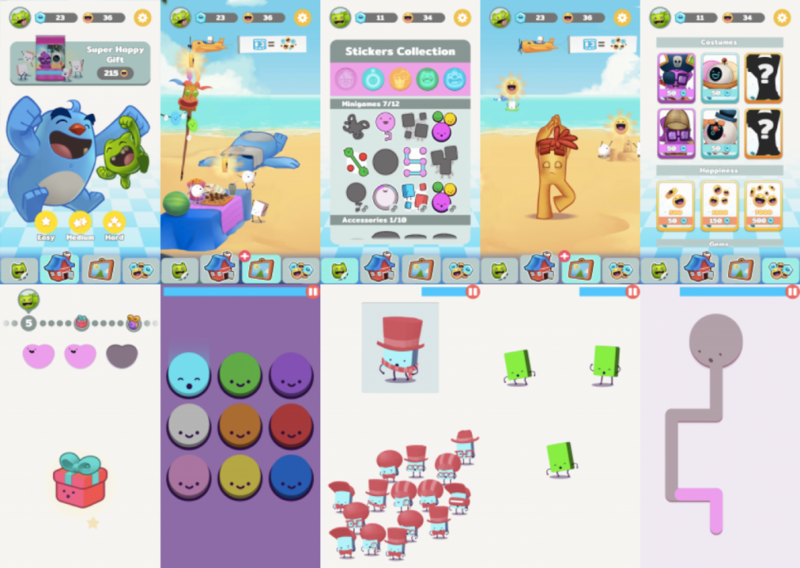 Customise the Party Pals with different hats and costumes. If you save up enough gems then you can even get funny costumes as well. With a special Party mode so that you can challenge your friends and family, all on the same device. Multiplayer games have never been so much fun for all of the family. Play with all of the family on your phone and tablet. Up to 8 players can play at the same time as you try to become the winner of the party. With additional mini-games designed for two players we know that families will have a lot of fun playing together. Available on iOS and Android and playable on mobile phones as well as tablet devices. Join the Party now. Google Play and the Google Play logo are trademarks of Google Inc. The Apple icon is a trademark of Apple Inc.